This entry was contributed by Willow Jacobson on July 3, 2015 at 8:00 am and is filed under Organizational and Personal Leadership, Tools and Practices, Uncategorized. You are meeting with members of your economic development board and trying to make decisions about infrastructure investment to promote growth. One member wants to focus the discussion on the need to construct a new shell building, while another member wants to talk about water and sewer infrastructure. The proponent of constructing a shell building just finishes a point about the need to have space available for new companies, when the water and the sewer proponent cuts in. “Yes, but….” Immediately the speaker knows that the water and sewer proponent is trying to take the conversation in a different direction and likely feels like they are not being heard. On the other hand if the water and sewer proponent had said “Yes, I hear your point about the need to have space available for new companies, and I am hoping we can also find a way to think about expanding the water and sewer infrastructure” there is a greater chance to build a mutual and productive conversation. This latter approach provides the start to creatively finding new strategies together that the “yes, but…” does not allow for. Communication is a critical skill for us all and one that we can always find ways to improve upon. When conflict arises in organizations or relationships it is often poor communication that is at the core of the issue. Two scholars, Argyris and Schön write about exploring issues of interpersonal relationships and identify some important strategies around communicating openly. They promote that public testing of assumptions and beliefs can help to avoid common communication failures. This process involves combining two important actions in communication: advocacy and inquiry. Advocacy includes statements that communicate what an individual thinks, knows, wants or feels. Inquiry seeks to learn what others think, know, want and feel. We often spend a lot of time assuming we know what the other person thinks or that they should know what we think and why we are approaching a problem in the way that we are, yet these assumptions are often the basis of many the challenges that arise. The work of Argyris and Schön has been around for many years and is the core of many training programs. A more recent development in the area of communication and leadership training is the use of improv skills to teach communication. If you have ever seen an improv show you know that the scenes develop quickly and people need to be able to build upon what their partners are saying. 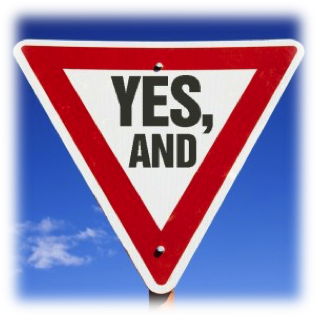 In improv they rely on a basic premise of “yes, and…”. As actors develop a scene together they need to take the information and create more from it, this leaves them in a position of needing to actively listen and be open to creating and inventing something new together. Being open to new ideas and process is a technique we could all benefit from. This lesson of “yes, and…” can help us all as we think about communication. It causes us to accept what the other person is saying and develop the thought, as opposed to the all too common “yes, but…” which shuts down the conversation. It does not take long to observe how often we hear statements like “yes, but”, “I agree, however”, “you raise a good point, yet…” These comments shut down the conversation and limit the chances to creatively build thoughts together and they also quickly communication to the other person that the conversation is not going anywhere and they will often disengage. Many who are practicing this new skill say that they find themselves counting how many times in a meeting people say “yes, but…” and challenge themselves to try to employ “yes, and…” in these settings and observe how people react. To learn more about the benefits of improv for government work see this article from Governing magazine.